The 16' Retro Giant Slide features is lots of fun! It features a walk-up style entrance that climbs 16' into the air. When you reach the top, you sit and slide really fast into a cool, fully inflated landing area! There is lots of cool water in the pooling area that is sure to cool you off during those scorching hot South Georgia Summer days! 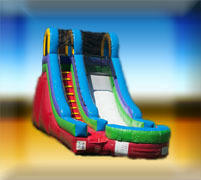 The Retro Giant Slide can be used by both kids and adults, ages 3 years and up. If you're planning on not using water, no problem. It can be used dry also; its just as much fun dry!